New Yorkers and tourists alike stroll Manhattan seeking out the magic of the holiday season. Union Square is not to be missed with the Holiday Market with the “best seasonal spirit” (PureWow), five spots to enjoy everything chocolate, must-eat spots for breakfast, lunch and dinner, and shops to visit to cross of your entire holiday shopping list. Here’s our guide to spending the ultimate day holiday-ing in the neighborhood. Tag us in your holiday exploring with #USQHoliday at @UnionSquareNY. Plan at least three hours in your schedule to explore and shop the Holiday Market in Union Square Park. If you’re local or visiting for multiple days, plan to come on a weekday to avoid the weekend rush. As you venture through the shops, peruse the Urbanspace Gift Guide for some of the market makers tips and favorite picks. Insta-worthy stops include the kiss and tell archway at the 14th Street and Broadway entrance, the words of wisdom tree mural at the 15th Street and Union Square West entrance, and the fountain of trees just outside of Little Brooklyn (a section featuring all Brooklyn-made gifts). Dress warm because the entire market is outdoors. 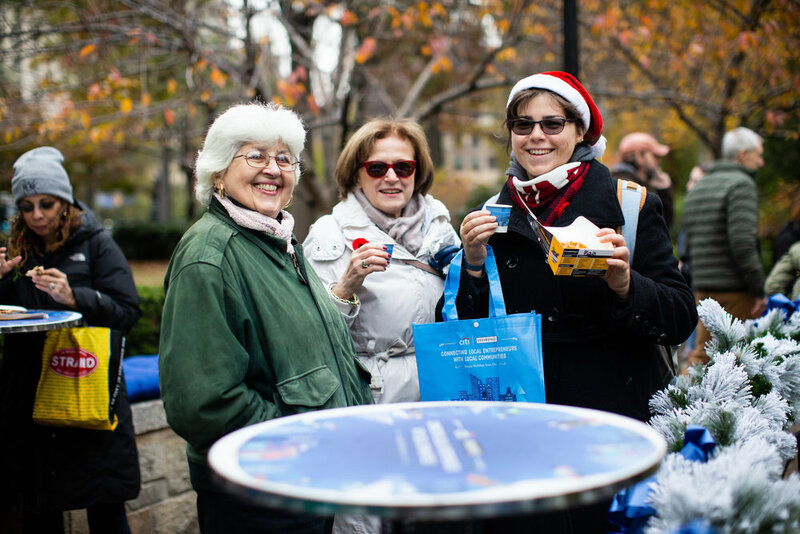 To warm up, stop into the Citi Holiday Lounge near the George Washington Statue (central), or pick up hot cider, chocolate or coffee from vendors throughout as you shop. While this might incline you to shop during the day, the market truly lights up at night. Enjoy a bite inside the market at more than 20 spots. Get Arancini at the Arancini Bros., Pizza at Bocce USQ, Empanadas at La Sonrisa, Ukranian specialties at the East Village’s famous Veselka Pierogi Bar, loaded Venezuelan perro (hot dogs) at Perros Y Vainas and more. Enjoy a full menu of nutella-packed items at New York’s Nutella Cafe on 13th Street and University. Enjoy espresso, gelato, pastries and more in the presence of a chocolate waterfall at Venchi. Metro New York has dubbed Union Square the chocolate district of Manhattan and the neighborhood has never been so delicious. Open for breakfast, lunch and dinner, stop into the Nutella Cafe (13th Street and University Place) - only the second such cafe to exist in the world - and try inventive recipes taking nutella to the next level. 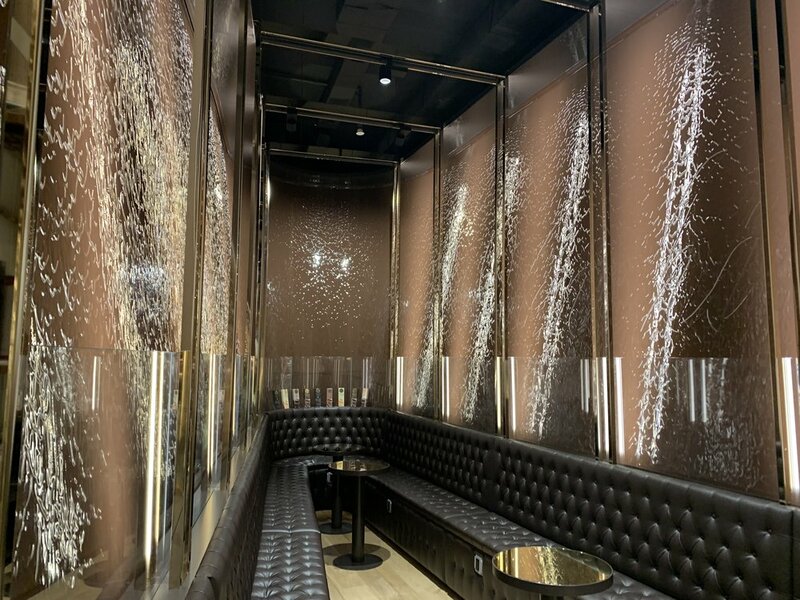 Venchi (Broadway between 17th and 18th Streets) is a chocolate lovers dream with its waterfalls of chocolate on the walls. City Bakery (18th Street between 5th and 6th Avenues) is Manhattan’s destination for delectable hot chocolate and homemade marshmallows. Blue Stripes Cacao (13th Street between University Place and 5th Avenue) Oded Brenner’s second chocolate-inspired restaurant in Union Square (visit Max Brenner Chocolate by the Bald Man on 14th Street and Broadway) is serving up all things cacao - the fruit that is processed into commercial chocolate - in smoothies, energy bowls, and even a chocolate shake topped with a piece of cake. Serving more than just chocolate, no stop to the chocolate district is complete without an Israeli chocolate rugelach or babka from Breads Bakery. The full-service bakery and cafe also serves coffee, sandwiches, soup, salad, and like the name suggests, lots of bread. If you’re going gourmet, there’s no better stop than Cocoa Store NYC (18th Street between Broadway and 5th Avenue), the US and world retailer and importer for bean-to-bar luxury products. Try chocolate brands like Amedei from Tuscnay, Castronovo - from one of the few female chocolate makers in America, and Fruition from Shokan, New York. 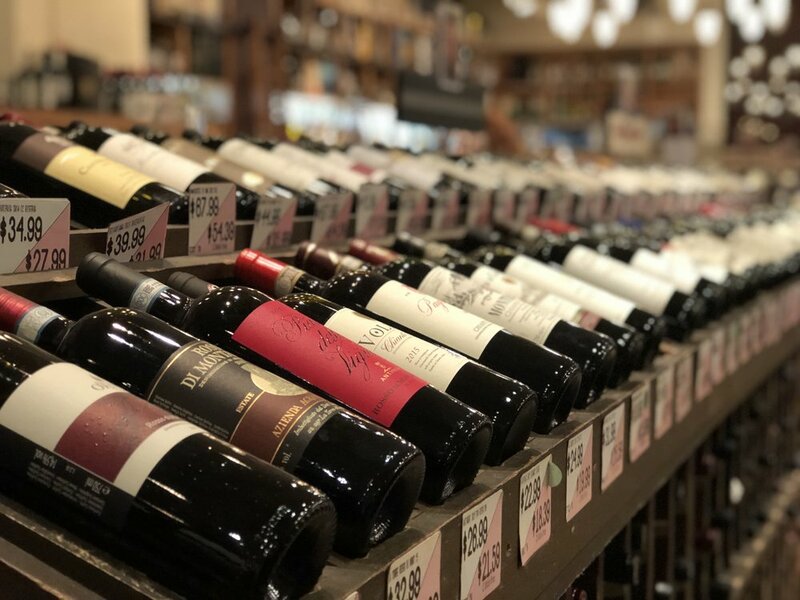 Wine connoisseurs at USQ Wines & Spirits can help you choose the perfect bottle. At Paragon Sports, find everything from running shoes + workout clothes to camping + ski gear. Check off everyone on your holiday gifting list - from hosts, creatives and bookworms, to beauty queens, trendsetters and kids. HOSTS: Don’t go to that holiday party empty-handed! Pick up a bottle of wine from Union Square Wines & Spirits, pair it with artisan cheese from Beecher’s Handmade Cheese, and add fresh holiday flowers from Starbright Floral Design. BOOKWORMS: Everyone loves curling up with a good book on a cold winter day. Find just what you’re looking for on Barnes & Noble’s four floors of books, pick up unique reads from Aum Shanti Bookshop and browse rare finds at Strand Book Store. BEAUTY QUEENS: From skin care to glitz and glamour, USQ has any beauty lover’s wish list checked off. Find on-trend makeup at Sephora, MAC Cosmetics and NYX, pick up skincare essentials at Innisfree, Fresh and Lush, and treat someone special to a spa day at Rescue Spa or The Red Door. TRENDSETTERS: Indulge your style-obsessed friend this season with gifts that will definitely get tagged in their #OOTD. Find fashionable, feminist gifts at women-owned Bulletin, gift trendy and functional athleisure wear (and more) from Paragon Sports, and find dapper ensembles for guys at Rothmans. Want even more curated shopping? Check out our Union Square Holiday Website or grab your copy of the 2018 Holiday Guide here or at the Holiday Market info booth. In addition to signature sweet treats, Daily Provisions has hearty meals for lunch and dinner. Mix and match authentic Middle Eastern fare at Panorama. Refuel from all that shopping with some quick bites from local Union Square eateries. Serving up delicious menu items for breakfast, lunch and dinner, Daily Provisions (19th Street and Park Avenue South) is the perfect cafe no matter what you’re in the mood for. Find hearty breakfast sandwiches and fresh pasta dishes, or satisfy your sweet tooth with a classic cruller. Stop in to Fat Cat Kitchen (14th Street between 3rd and 2nd Avenues) for one of the best chocolate chip cookies in the city. Also find coffee beverages and healthy made-to-order sandwiches and salads. Panorama Middle Eastern Grill (12th Street and Broadway) is serving up healthy + authentic grab-and-go Middle Eastern fare. Stop in to try freekeh, doner burger, shawarma hummus, and halloumi fries. For an afternoon pick-me-up and a sweet treat, Champion Coffee (14th Street) or Irving Farm (Irving Place). Enjoy French-inspired meals and hand crafted cocktails at Tocquville. Try classic udon noodle bowls at Tsurutontan. When you’ve finished your shopping, find the perfect restaurant to sit and stay a while. Warm up with a bowl of ricotta gnocchi or USC burger, a glass of wine and a full seasonal selection of entrees at Union Square Cafe’s (19th Street and Park Avenue South) destination for warm hospitality. Book a table at Tocquville (15th Street and Fifth Avenue) for seasonal, French-inspired cuisine from a multi-course tasting menu, in a handsome space on a quiet street. 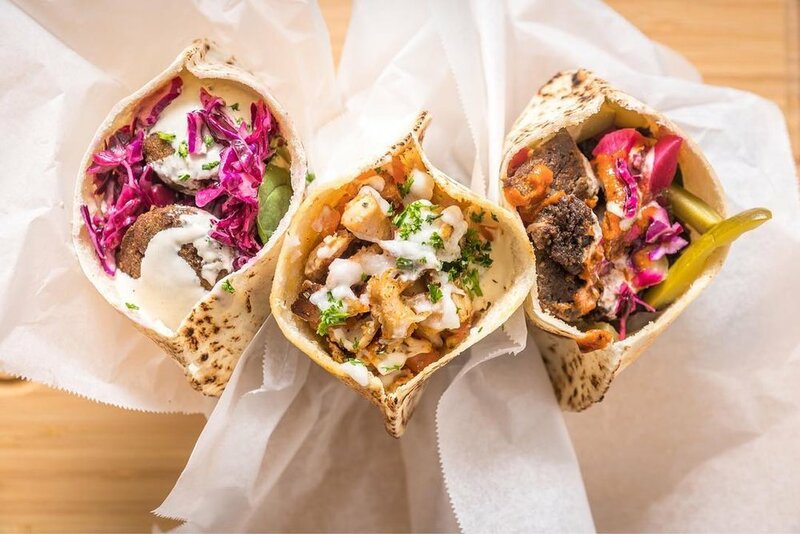 You might be in Manhattan, but the menu at Nur (20th Street and Broadway) draws from the rich and flavorful cuisine of the Middle East with modern, bold flavors featured in dishes made for sharing. Make reservations at Le Coq Rico (20th Street and Broadway), a new-American bistro serving heritage breed whole chickens and decadent egg desserts. Try Tsurutontan for steaming hot udon noodle bowls. Their flagship US location is at 16th Street and Union Square West.